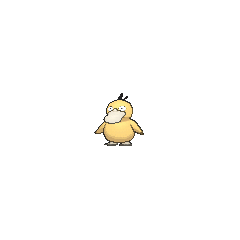 Psyduck in game: 5,528 Who? Important notice! 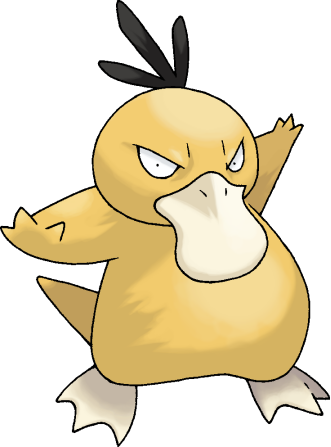 Pokemon Psyduck is a fictional character of humans. Psyduck is a yellow Pokémon that resembles a duck or bipedal platypus. Three tufts of black hair grow on top of its head, and it has a wide, flat, cream-colored beak and vacant eyes. Its legs, arms, and tail are stubby and its webbed feet are cream-colored. There are three claws on both of its hands. Misty has a Psyduck that she accidentally caught in Hypno's Naptime. It is a constant source of frustration for her, as it frequently emerges from its Poké Ball to attempt to battle the opponent in substitution of one of her other Pokémon. Regardless of this, she has been shown to deeply care for it. Despite being generally shown as dimwitted and oblivious, when its headache gets bad enough, it has been shown to use phenomenally powerful Psychic-type moves which far exceed its normal ability. In Bye Bye Psyduck, a girl named Marina owned a Psyduck that wasn't as dopey as the one Misty had. In Sitting Psyduck, a Psyduck was owned by a rich girl named Emily. However, the Psyduck didn't like having a pampered life-style and kept running away. Team Rocket used a Psyduck in their scheme in Not on MY Watch Ya Don't!. 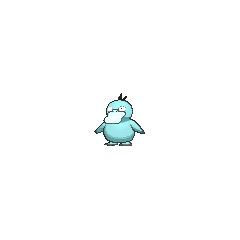 Nine Psyduck appeared in The Psyduck Stops Here! ; six parents and three babies. Three of the parents were blocking the path that Ash and his friends tried to pass on their way to Celestic Town. The Psyduck weren't able to return to their real home, Lake Psyduck, due to three Muk. Two Psyduck were part of an exhibition in Flower Power. A Psyduck appeared in Beauty and the Breeder where it participated in a Pokémon breeding competition. A Psyduck appeared in Dueling Heroes and Lucario and the Mystery of Mew. A Psyduck was used by one of the students of the Pokémon Trainer's School in Gonna Rule The School!. A Psyduck appeared in Win, Lose, or Drew! as a Pokémon in the Contest. A boy's Psyduck appeared in Once in a Mawile! when Samantha's Mawile fell in love with it. Psyduck made a small appearance in The Rise of Darkrai as one of the Pokémon Darkrai hit with a Dark Void. A Coordinator's Psyduck appeared in Dawn's Early Night! participating in a Double Performance along with a Duskull during the Hearthome Contest. Dawn's Piplup spotted a Psyduck in Sleepless In Pre-Battle!. A Psyduck appeared as a mask for the festival in Capacia Island UFO!. A Psyduck appeared in Lumiose City Pursuit, Mega-Mega Meowth Madness!, Day Three Blockbusters!, Battling With a Clean Slate! and even in a flashback in Mega Evolution Special I and Garchomp's Mega Bond! at Professor Sycamore's lab. Psyduck has made cameo appearances in A Blustery Santalune Gym Battle!, Battling on Thin Ice!, Grooming Furfrou! and Heroes - Friends and Faux Alike! and A Fashionable Battle!. A Trainer's Psyduck appeared in A Battle by Any Other Name! participating in the Poké Puff Contest. A Trainer's Psyduck appeared in Summer of Discovery!, Foggy Pokémon Orienteering! and Battling Into the Hall of Fame!. A Performer's Psyduck appeared in A Showcase Debut! participating in the Coumarine City Pokémon Showcase. It reappeared in Performing with Fiery Charm!, Party Dancecapades!, Master Class is in Session!, and Performing a Pathway to the Future!. 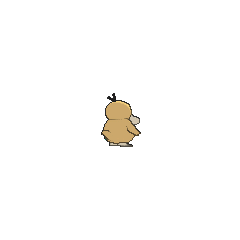 A Psyduck appeared in SM004. 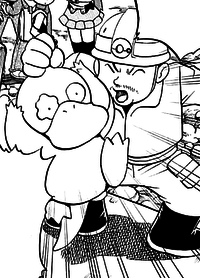 Six Trainers' Psyduck appeared in SM006. 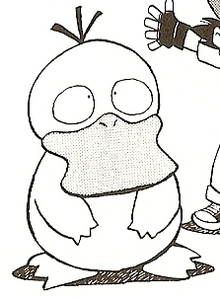 A Psyduck appeared in SM008 and SM009. EP032 Psyduck's attacks Ash's Pokédex Psyduck's attacks are: Number one: Tail Whip. Number two: Scratch. Number three: Disable. Number four: Confusion. When Psyduck's headache becomes severe, it uses amazing power. In the Red, Green & Blue chapter, Sigh for Psyduck, an undead Psyduck that had been brought back to life by a Koga's Gastly appeared in the Pokémon Tower. It first appeared to Red like a normal Psyduck, until it attempted an assault on him: its eyeballs suddenly sunk into its eye sockets and some skin fell off, revealing its bones. Since it was just a mindless undead, it was easily destroyed by Red's Bulbasaur using Vine Whip. 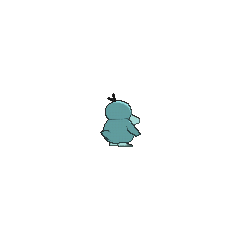 Another Psyduck appeared as a silhouette when Green explains about Mew in The Jynx Jinx. Psyduck's first real appearance was in Breath of the Dragonair Part 1 where it was used by a Trainer in a surfing contest, before it was interrupted by Lance controlling the winning prize, a Dragonair. 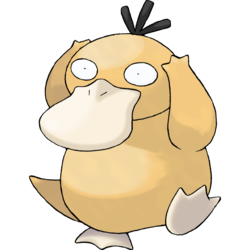 A Psyduck is seen as one of the Pokémon at Earl's Pokémon Academy in Violet City in Slugging It Out With Slugma. A Psyduck later appeared in Suddenly Suicune III and Absolutely Azumarill where Crystal fails to catch it. A Psyduck appeared in The Last Battle XIII as one of the Pokémon sent to help the fight in Ilex Forest. Mr. Foreman was shown with a Psyduck. After several other appearances, a herd of Psyduck appeared, blocking the route to Celestic Town, just as they had in the games. However, included among them were Trainer Pokémon, and this was all a ruse by Team Galactic, which Cynthia catches on to shortly after calming them. 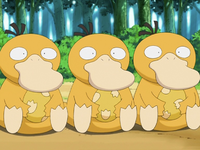 Psyduck's design appears to draw inspiration from both ducks and platypuses.